Looking for Redfeather by Linda Collison captures all of the emotion and uncertainty of being a teenager, delivered through the practiced and nonjudgmental eye of an experienced writer. It’s hard to imagine the road trip’s classic sense of isolation and exploration translating to the twenty-first century, with people (and especially teens) linked to each other through smartphones, and the sense of mystery somewhat diminished by the ready availability of Wikipedia and GPS directions. But Linda Collison has incorporated these elements into Looking for Redfeather, creating a story that rings true for the times and keeps the essential feeling of travel and self-exploration intact. Collison has the wide range of experiences and careers that often make for a good novelist, having worked as a registered nurse and skydiving instructor, among other occupations. Her prior publications range from a guide to Colorado wineries to two nautical adventure books. In Looking for Redfeather, she introduces three teens: Chas, a young man from Baltimore fleeing the reality of his mother’s impending death; LaRoux (née Faith Appleby), a girl out to make a name for herself as a singer and performer; and Ramie Redfeather, a half-Apache man-child who embarks on a search for the father he’s never known. The three meet and band together, searching for Ramie’s father, traveling in Chas’s grandmother’s classic Cadillac, and learning much about themselves. There are many references to books, music, movies, and television shows. This aspect of the characters’ vocabularies works well not only to convey the teens’ perceptions, but also to portray the unceasing adolescent search for models and heroes, for a “scene” to fit into, and ultimately for identity. The writing is unsparing but honest, with several depictions of drug and alcohol use. 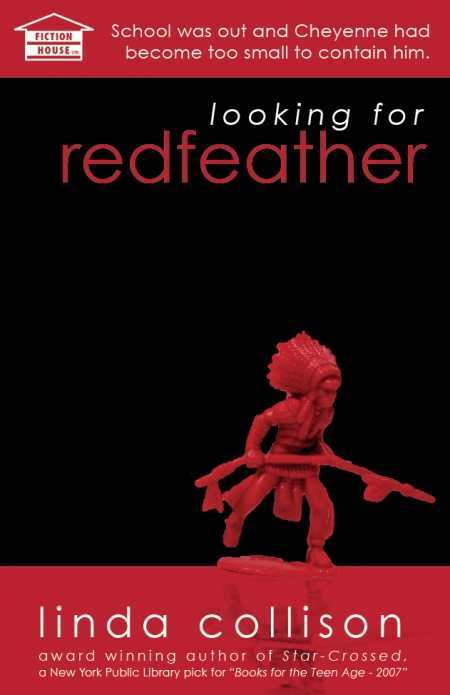 Looking for Redfeather is the kind of novel parents might be unwilling to recommend to younger or immature teens, but readers who can handle the unflinching details may judge it one of those seminal books that, by giving a wider view of the world, helps to safely deliver teens to adulthood.